I had a hair appointment a couple of weeks ago, and Allen drove across town with me since we had dinner plans close to the salon later that evening. He killed some time in a bookstore while he waited for me, and I was surprised to see he had bought a cookbook. Although he is great help in the kitchen, usually in the clean-up department, he doesn’t cook that much. He makes the coffee every morning without fail, he’s in charge of bacon and eggs for Saturday morning breakfast, he always mans the grill, but he never consults a cookbook. His purchase was a good choice, though. We’ve been trying to eat healthier, so he picked up a Weight Watchers® book of chicken recipes. I was practically drooling over the recipes and gorgeous pictures of chicken appetizers, soups, salads, and entreés. I kept gravitating to a recipe for Cream Cheese and Pepper Jelly Chicken and made a mental note to pick up the ingredients on the next grocery shopping run. I chose Luscombe Farm Jalapeño Pepper Jelly for the dish. The Anna, Texas Luscombe Family farm was established in 1913 and is operated today by fourth generation family members, who produce an award-winning line of fiery jellies and peppers. Their pale green jalapeño pepper jelly has a spicy kick that is tempered by organic pure cane sugar. 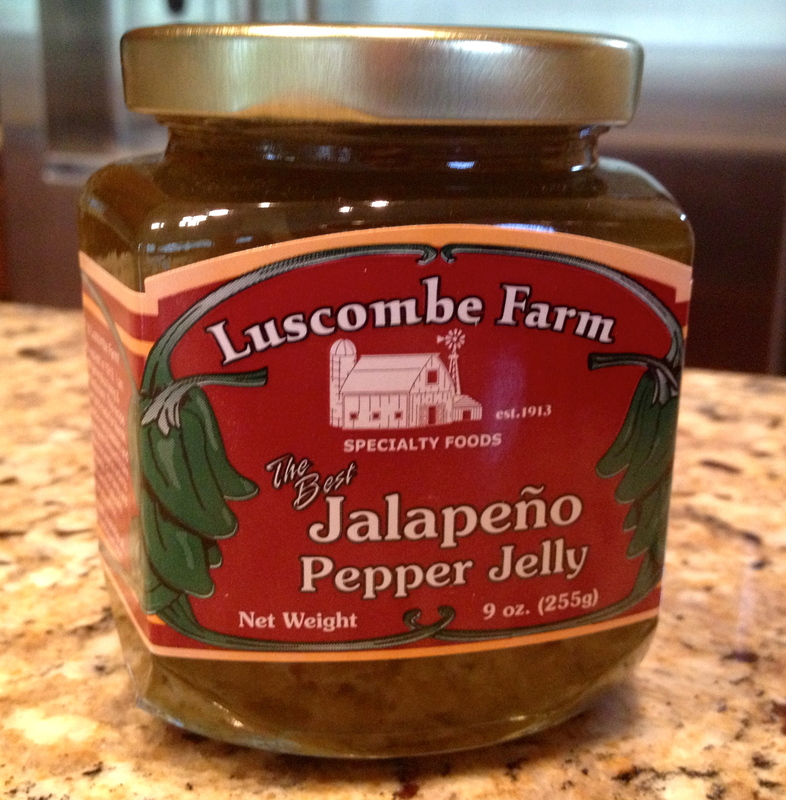 The Luscombes remove the peppers’ seeds and membranes, so even those who aren’t fond of jalapeño heat can enjoy it. It was so great in the chicken recipe! Full disclosure–my mental grocery shopping notes weren’t complete, and I forgot to pick up the low-fat cream cheese called for in the recipe, so I adjusted it to use some regular cream cheese I had on hand. 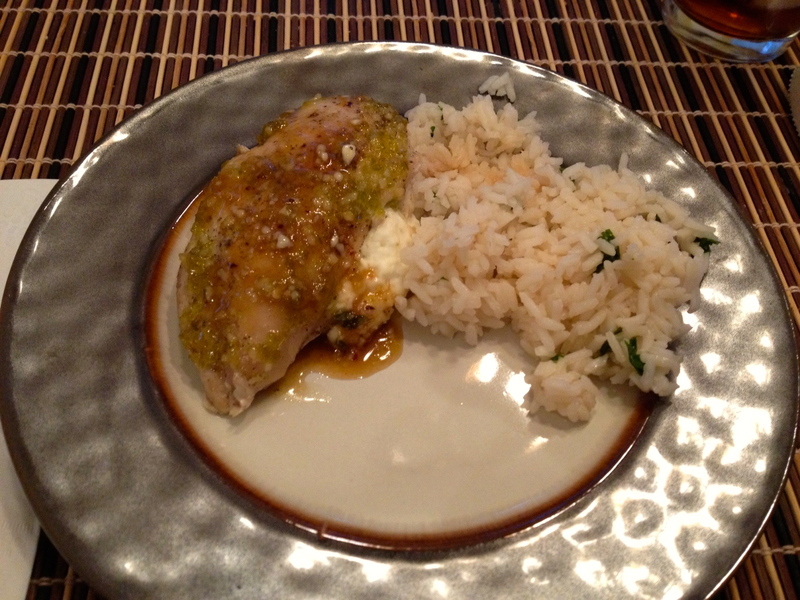 The recipe wasn’t quite as healthy as intended, but it was definitely delicious served with cilantro lime rice. Preheat oven to 400°. Place jelly and garlic in a small microwave-safe bowl. Microwave on high temperature 45 seconds, or until jelly melts, stirring after 30 seconds. Combine cream cheese and cilantro in another small bowl. Cut a horizontal slit through thickest portion of each chicken breast half to form a pocket. Stuff 1/4 of the cheese mixture into each pocket, and close openings with wooden picks. Sprinkle chicken with salt and pepper. Heat a 12-inch cast-iron (or other oven-proof) skillet over medium high heat and coat with cooking spray. Add chicken to pan, skinned side down, and cook for about 4 minutes. Turn chicken over and brush with jelly mixture. Place pan in oven and bake for 15 minutes, or until done, basting with jelly mixture in skillet after 7 minutes. Remove pan from oven, and transfer chicken to a serving plate. Add water to pan, stirring with a wire whisk to deglaze the pan and make sauce. Let stand for 5 minutes. Remove and discard wooden picks. Spoon pan sauce over chicken and enjoy! The Luscombe Farm website has other recipes that use their awesome jellies. Try some in your kitchen! It is AMAZING JELLY ! Their entire line is great, Its my jelly of choice. Nancy, we will be tasting more of Luscombe Farm’s products soon!